Percale Cotton Bedding has long been sought after for it's refined, crisp feel. It is the time of soft that wears and washes beautifully, with many saying that it just gets better with time. While less smooth and silky than it's Sateen counterpart, Percale cotton is treasured by connoisseurs of luxury bedding. A top-quality percale is cool and light, and drapes perfectly over you while you rest. In many ways, it captures the true essence of cotton. Technically speaking, a Percale is achieved by using a straightforward, over-under weaving pattern, while a Sateen uses a variety of over & unders to give it it's distinct smoothness. All you need to know is that whatever your preference, we can help you put together your dream bed! 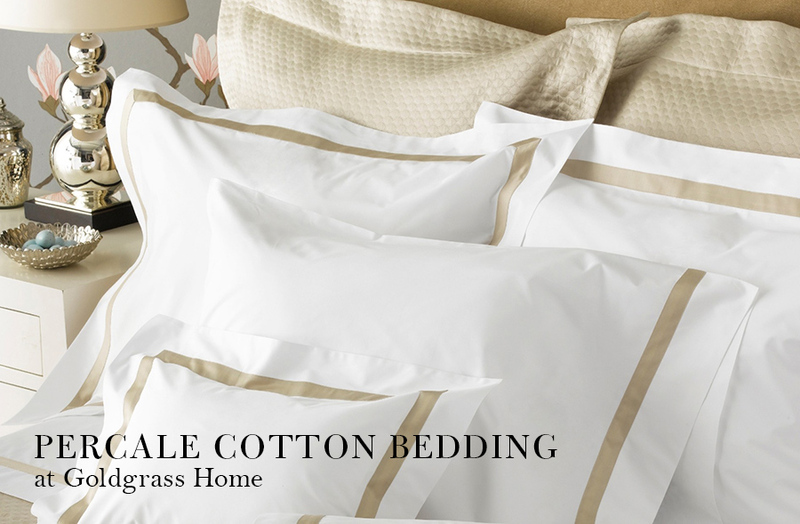 At Goldgrass Home we have a wide selection of Percale Cotton Bedding. From luxury linen maker Matouk, we can offer 500, 600 and 1000 thread count (TC) Egyptian cotton, in white and colour, with a range of elegant embroidery, pattern and fine detailing. SDH has many options of Italian crafted, Egyptian & Organic cotton percale. Los Angeles Designer brand Matteo uses a percale cotton for their Tru and Nap collections, each available in 17 garment dyed colours, made custom just for you. And Coyuchi and GLO make the purest Organic cotton percale you'll find. Obviously, words can't do justice to the amazing styles and textures. Stop into Goldgrass Home for the full experience, and one of our trained stylists can help guide you in putting together your new collection!